Since 2006, the Society of American Archivists has provided members with public relations kits that offer practical information and great ideas to help you make your archives program more visible. You can access past PR kits by clicking on the graphic images to the right or on "Related Pages" at the bottom of this page. Additional tips and tools are contained in supplementary material available at http://www2.archivists.org/aam. Whether you're interested in planning an event, issuing a press release to attract media coverage, or prepping for a media interview, these "evergreen" resources will assist you in enhancing public awareness of your repository—and your profession! For 2010-2013, SAA is focusing its public awareness efforts on a year-long campaign—I Found It In The Archives!—that reaches out to archives users nationwide to share their stories about what they found in the archives that has made a difference in their lives. (To read more about participating in this initiative, see http://www2.archivists.org/i-found-it.) Beginning in October 2011, the I Found It! campaign will be fully integrated with American Archives Month. Although SAA did not publish a PR Kit and Poster in 2010, many organizations conducted American Archives Month activities in October—and many did so at a higher level than in past years. See below for your colleagues’ great ideas for public outreach! And to view the Archives Month posters that many state archives published in 2010, be sure to check out the Council of State Archivists’ poster directory at: http://www.statearchivists.org. For the entire month of October, Emerson College tweeted five days a week. Each week the college featured a different collection or theme from its archives to give students and other users trivia and photos of collections held by the archives. Highlighted the first week was the Warren Debenham Comedy Novelty Collection. Week two was the Sigmund Lavine Gilbert & Sullivan Collection. Week three was a collection of alumni memorabilia from Mary Isobel Ellis, an Emerson student from 1908-1910 (which coincided with Parent’s Weekend on campus). The final week, in honor of Halloween, images of costumes were selected from various collections and the college sent out one costume a day. In order to get the message out about the Twitter feed, the college displayed posters each week related to the collections. To look at the Tweets and the corresponding Flickr images, visit www.twitter.com/emersonlibrary and look for #ArchivesMonth at #ECArchives. Poster 1. Poster 2. Poster 3. Poster 4. Poster 5. Western History Center Archivist Teri Hedgpeth's task is to make her institution's rooms full of records, books, diaries, letters, photographs and maps even more accessible to all researchers. Interpersonal communications students are using the center and Hedgpeth's expertise to collect oral histories from the Salt Creek area. Hedgpeth recently met one woman who asked for a place to sit down after finding the obituary of her biological father; she'd just found out she has brothers. "You never know the relevance," she said, "what treasures or gems it might hold for researchers." Read more about her mission to make archives more well known around the world. As part of Archives Month, the National Archives and Records Administration, in conjunction with the DC and Maryland Caucuses, hosted the 2010 Archives Fair. Attendees were encouraged to connect with regional archivists and archival repositories on Wednesday, October 27, at the National Archives by sharing information about diverse collections at the 14th Annual Washington, DC, Metropolitan Area Archives Fair. For more information and to learn about the Papers of the War Department project, the Civic Engagement project and the Philadelphia Area Consortium of Special Collections Libraries PACSCL Hidden Collections project, and the Alan Mason Chesney Medical Archives of the Johns Hopkins Medical Institutions records management project, visit the NHPRC website. Pamela Whitenack, director of the Hershey Community Archives, will speak on October 26, at 7 p.m. about her experiences as oral history archivist for both the Hershey Chocolate Company and the town of Hershey, Pennsylvania. Hear about the vital role that oral history plays in preserving the legacy of the original company town and the company that made chocolate available to the masses. Where: School of Information, 1616 Guadalupe, Rm 1.208. The event is open to the public, and is hosted by the SAA-UT Student Chapter. For more, click here. According to Archives & Special Collections Consortium Library Head Arlene Schmuland, Archives & Special Collections, University of Alaska Anchorage/Alaska Pacific University Consortium Library and Alaska Moving Image Preservation Association (AMIPA) held a joint open house on Wednesday, Oct. 6. View the invitation on the Consortium Library blog, http://www.consortiumlibrary.org/blogs/archives/2010/09/29, or an entry about the event itself at: http://www.consortiumlibrary.org/blogs/archives/2010/10/07. In celebration of American Archives Month, the Rochester Museum & Science Center offers a special program on October 23 that highlights the importance of archives and archivists in safeguarding local history and keeping our heritage alive. At 10 a.m. in the museum's Bausch Auditorium, AKWAABA: The Heritage Associates will present "Rochester's Unknown Ones," an original theater piece based on archival primary sources. The drama introduces members of the active and vibrant African American community that Frederick Douglass found when he came to live in Rochester. This program will be followed by a guided tour of the RMSC exhibition "Flight To Freedom," which includes archival material related to Rochester's Underground Railroad. For more information, visit www.akwaabatours.org. In celebration of Archives Month, the Iowa State University Special Collections blog features an extensive "Online Tour" post that includes a brief explanation of what a Special Collections and University Archives is all about and an online version of the Special Collections tour. Take the tour here! October is American Archives Month, and the Indiana University South Bend Archives is celebrating with an Open House on Thursday, October 21, 2010 from 3:00 to 5:00 p.m. on the second floor of the Schurz Library (in the common area). The Archives will have items on display from its labor-related collections in conjunction with the Campus Theme, "The Meaning of Work," and light refreshments will be served. Additionally, Archivist Alison Stankrauff will be giving two tours of the Archives during the Open House. Please join us to view various items related to local labor history and learn more about the IU South Bend Archives! To celebrate Archives Month, the Vermont State Archives & Records Administration (VSARA) has asked the keepers and users of historical records to share brief stories on "ah ha" moments occasioned by the information held in historical records. For details and compiled stories, click here. The La Crosse Public Library's Archives received the 2010 Governor's Award for Archival Achievement, recognizing the library's extensive archives and the ways access has been given to the archives. These annual awards recognize outstanding work in historical records preservation, advocacy, and access in Wisconsin. SAA past president and current Wisconsin State Archivist Peter Gottlieb noted, "A lot of archives are content to wait for people to find them,” but that “What makes Anita’s program a natural winner is the initiative to connect what you have with how you can help people. They’re not passive. They really get out there in front of people." Among other projects, the library has helped middle school students with National History Day projects, provided images and information for a book and television series, and unearthed new discoveries for researchers. Read more here and here. On Cotober 10, 2010, "60 Minutes" ran a full segment on archives, centered around the publication of Nelson Mandela's new book, Conversations with Myself. The book features Mandela's reflections, stories, joys, and sorrows from his private archives, focusing on the inner motivations animating the public man and international icon. Video footage of archival records and archival stacks from the Nelson Mandela Foundation's Centre for Memory highlight the personal, emotive, political, and symbolic powers of the archival record. The articulate archivist, Verne Harris, speaks on camera several times about Mandela and his archives. View the segment here. Thursday, Oct. 7, 10 a.m.: Tour of the Congregational Library with SCoSAA Secretary Abe Miller. Come check out the archives of one of the oldest religious organizations in the country, which will certainly provide fodder for the conversation during the lunch we are also sponsoring. Click here to RSVP; space is limited. Tuesday, Oct. 12, Kotzen Meeting Room, Lefavour Hall, 6 p.m.-7:30 p.m.: Panel discussion "What Archivists Need to Know to Stay Relevant." Come listen to a group of working archivists from the JFK Library, the Boston Symphony Orchestra, the Boston Police Department and more discuss their thoughts on the industry and being the best archivist you can be. 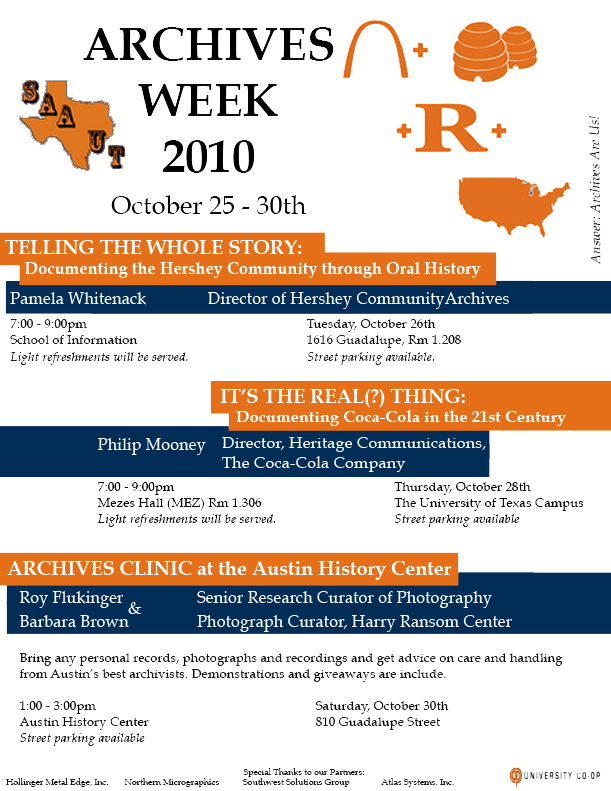 Tuesday, Oct. 19, GSLIS Tech Lab, Palace Road Building, 5:30 p.m.-6:30 p.m.: Archives and Open Access Week seminar. Merging archives practice with Open Access Week. Hands-on demonstration about applying the theory to archives and what it may mean for future collections. This year's Archives Month theme, "Postcard Wisconsin," focuses on historical postecars that highlight how people keep archival documents about themselves, their families, and their experiences to preserve memories and share stories. Read the "Postcard Wisconsin" blog for highlight unique collections of postcards from participating historical societies across the state for the month of October. Submit an event to be added to the Archives Month Event Calendar. The WHS Archives Month website also features an Archives Open House DiY Guidelines toolkit to help archives plan and host an open house. The Newberry Library presents, "Everywhere West": Daily Life Along the Chicago, Burlington and Quincy Railroad, at the Donnelley Gallery, Aug. 10 - Oct. 16. The exhibition draws from the unpublished images of noted Depression-era documentary photographers Esther Bubley and Russell Lee, who were hired by the CB&Q Railroad (now part of the BNSF Railroad) to take photographs of the people, industries, farms, and towns along the Burlington Route. Click here for hours, or visit the Newberry Library's YouTube page to catch a glimpse of the Library's collections featured in this exhibit. The exhibition was featured on Chicago Public Radio's magazine news segment, Eight Forty-Eight. The 15th Annual Archives Month Conference at Oheka Castle (Long Island, New York), organized by the Long Island Library Resources Council, united librarians and archivists. Attendees swapped stories and resources, and three speakers offered insight. Tony Traguardo, media librarian at the Port Washington Public Library, spoke about the Long Island Music Hall of Fame's upcoming induction November 16 at Oheka Castle, and showed clips of a few famous inductees. The Hall of Fame is dedicated to the idea that Long Island's musical heritage is a resource to be celebrated and preserved for future generations. Michael Cogswell, director of the Louis Armstrong House Museum in Corona, Queens, talked to the audience about cataloguing the enormous collection of photos, tapes, and scrapbooks Armstrong made over the years he lived in the house, from 1943 until his death in 1971. While Geri Solomon, archivist at Hofstra University and assistant dean of special collections, discussed some of Long Island's early entertainers, including several who were more notorious than talented. You’ve heard of Pub Crawls, but have you ever heard of an Archives Crawl? In celebration of Oregon Archives Month, archives organizations in Portland are sponsoring the first Archives Crawl on Saturday, October 2, 2010, from 11 a.m. to 4 p.m. Participants walk, bike, run, or crawl at leisure among four downtown locations to learn what archives have to offer researchers, students, genealogists, scholars, homeowners, history buffs, and the curious of any age. Portland Archives and Records Center, the Portland State University Library, Multnomah County Central Library, and the Oregon Historical Society offer tours and activities that bring history to life, including displays of local history provided by 30 local archival institutions, fun activities for the whole family, and information about archives and what they are doing for the community. Participants can also get a free crawl passport stamped; stamps from all four locations earn entry into a raffle for prizes donated by local businesses. After the crawl, the Oregon Historical Society hosts a party starting at 4 p.m. with free food, beverages donated by McMennamins, a raffle, and live entertainment. Free, open to the public, and intended to show people how wrong they are when they think of "archives" as only dusty records stored in dark basements, this event is hosted by the City of Portland Archives and Records Center; Multnomah County Library, John Wilson Special Collections; Oregon Historical Society Research Library; and Portland State University, Special Collections and University Archives. For a list of sponsors; a complete list of archives, museums, and cultural heritage organizations with representatives at the host locations; frequently asked questions; more details about the event; or contact information, visit 2010 Oregon Archives Crawl. Archives throughout the Smithsonian will be celebrating 2010's American Archives Month with the first-ever Smithsonian Archives Fair and a 31-day Blogathon. Featuring a lecture series on projects and research based on Smithsonian collections, informational displays from more than a dozen archives at the Smithsonian, and an “Ask the Smithsonian” program, the Archives Fair is free and open to the public on Friday, October 22, 10 a.m. to 5 p.m. at the S. Dillon Ripley Center on the National Mall. The “Ask the Smithsonian” program at the Archives Fair features hands-on consultations and preservation tips from archivists, librarians, historians, and conservators to teach local-area residents about how to care for items they have tucked away in attics, closets, and basements of their homes. Pre-registration is required for the “Ask the Smithsonian” review portion. Attendees seeking to have archival materials reviewed may bring in one to two easily transported archival items (two if the items are related) no larger than a shopping bag. Archives include everything from letters, diaries, maps, business records and scrapbooks to photographs, films, recordings, and computer disks--anything that contains information of enduring value. Objects such as paintings, dolls, clothing/textiles, mechanical objects, toys, will NOT be reviewed. The reviews are informational only; monetary appraisals will not be given and donations will not be accepted at this time. Visit Archives Month at the Smithsonian for more details, to register, to learn about chatting with experts via the Smithsonian Facebook page, and for the Archives Fair Schedule and Speakers. Read the invitation and view the October 19 FOX 5 feature of the Archives Fair that included preservation demonstrations and tips Freer Gallery of Art and Arthur M. Sackler Gallery archivist Rachel Woody. Archives throughout the Smithsonian Institution are participating in a 31-day Blogathon hosted by the Smithsonian Collections Blog. Each day, archives staff will blog about what happens in their archives, describe projects they are working on, and tell stories about particular items in their collections. Visit Archives Month at the Smithsonian for a list of participating blogs. Three Rivers Historical Society plans to celebrate American Archives Month with its annual Old South Days open house at the Browntown Museum on October 2 from 9 a.m. to 4 p.m. (EST). The event is free to the public. Three Rivers has compiled one of the most extensive records of family genealogies and local histories in Williamsburg County (South Carolina) and the surrounding area. Last year, Browntown’s open house featured food and historical entertainment for visitors. Storytellers, civil war historians, and a blacksmith demonstration were also highlights. The society's director, Nell Morris, said there would be more fun-filled activities at the open house this year at the museum, located at 3114 Johnsonville Hwy, SC-341, between Johnsonville and Lake City. The museum grounds include a collection of permanent structures visitors can tour during the open house, including a blacksmith shop, smoke house, pie safe, and one of the few remaining cotton gins on the East Coast. On October 1, from 1:30 to 5:30 p.m. (CST), the Wittliff Collections and the University Archives at Texas State University-San Marcos will host their fifth annual Archives Month celebration. This year’s free event features a panel called “Know Your Audience: Tips for Successful Writing,” at the Wittliff Collections on the seventh floor of Texas State’s Alkek Library. Not just for archivists and librarians, anyone interested in hearing expert advice on successful, professional writing is invited to attend. Each panelist will give a short presentation about a specific type of writing, and a moderated discussion will follow. The panelists will then take questions from the audience. The scheduled panelists and their topics are: Dr. David B. Gracy II, editor of Libraries and the Cultural Record, speaking on scholarly writing; Kris Toma and Katie Salzmann, co-editors of Southwestern Archivist, on newsletter writing; Pat Hawthorne, Director of Research and Learning, Alkek Library, on press releases; and Anne Peters, Communications Coordinator, UT-San Antonio Libraries, on social media. "MARS and More: An Introduction to the North Carolina State Archives' Online Resources," will take place October 5, 10-11:30 a.m. in the State Archives/Library Building's second floor computer lab. The presentation will focus on historic North Carolina documents are available through the Internet on the Manuscripts and Archives Reference System (MARS). Other topics include finding out about family through online indexes, references, digital collections, and social networking tools. "Getting to Know Your Family: The Family Records Collection of the State Archives and State Library" will take place from Noon to1 p.m. in the State Archives/Library Building Auditorium on October 6. Tracing ancestry is not always easy. Often the only place some marriages, births, and deaths are recorded is in the family Bible. The State Archives and the State Library of North Carolina have created North Carolina Family Records Online, found here. The State Archives plans to host Triangle Home Movie Day on October 16, from 1-4 p.m. in the State Archives/Library Building auditorium. During this celebration of amateur home movies, visitors can meet local film archivists, find out about the long-term benefits of film versus video and digital media, and watch those old family films. For more information about these activities about Archives Week, click here. Organizations and repositories around the state are celebrating American Archives Month with events encouraging the public to “Travel Back in Time” and discover the wealth of documents and artifacts comprising Georgia’s history. People from across Georgia will be able to journey back to a WWII combat pilot’s training experience in Douglas, an African-American’s life in rural Thomasville during the Civil Rights era, the popular music evolution of the 1960s, and simpler days in 19th century Augusta. They can learn about the legacy of Robert W. Woodruff, the evolution of the Georgia Department of Transportation from the mud to the sky, and the founding families of Roswell. Talks on researching church records, saving family treasures, handling electronic records, and the literature on archival theory will further educate the public on how to preserve and explore their own memories. 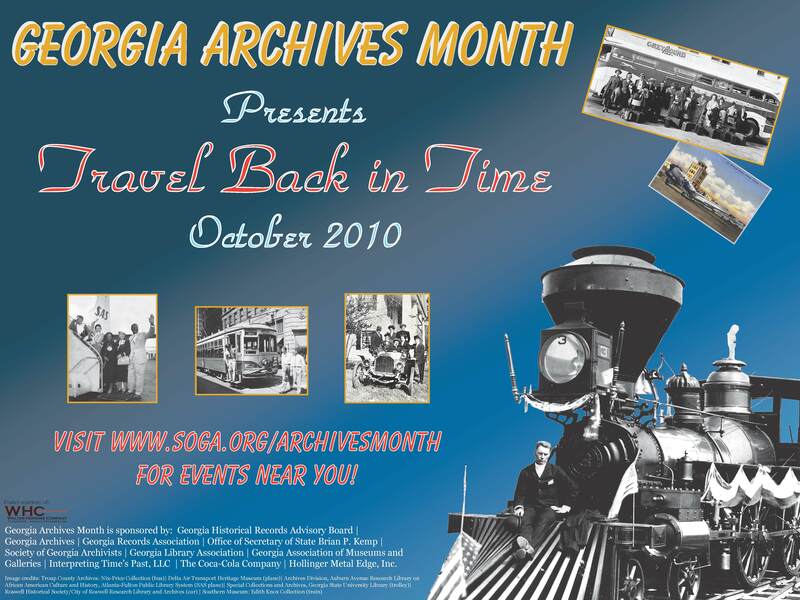 2010 Georgia Archives Month Events, Flyer, Poster. The National Archives and Records Administration, in conjunction with the DC and Maryland Caucuses, will host the 2010 Archives Fair on October 27 from 9 a.m. to 1 p.m. at the William G. McGowan Theater Lobby in Washington, D.C. Plan to connect with regional archivists and archival repositories and celebrate Archives Month. Participants from archives and related cultural institutions will reserve table space to share information about archives-related activities with their colleagues. This year’s program features Archivist of the United States David S. Ferriero who will moderate a panel discussion by U.S. government agency historians related to the role historians play in their agencies. In celebration of American Archives Month, the Salt Lake County Archives is planning several events, a book display, and a series of essays authored by UMBC faculty, staff, and alumni focused on their personal experiences working with archives and special collections across the United States. Click here to see American Archives Month events such as “Discard,” a discussion with Lynn Cazabon on October 6. Or the panel, "Using Images for Original Research, " on October 18, or the In the Archives essay compilation. Enter Gaylord's “Worst Archives” Challenge by October 31 and win $250. Is your storage space less than ideal? Has your budget for preservation materials been cut? Do some of your housing materials need updating? Submit a photo and brief description of a challenge you face with your archival collection. The best entry will receive a $250 gift certificate to help make over your archive. Deadline: October 31. The Society of American Archivists Student Chapter at UW-Milwaukee encourages students to visit their local archival repositories. What better way to do this than with a a scavenger hunt! The Student Chapter's scavenger hunt will run for the month of October, at the end of which a name will be drawn randomly to win $100. Click here to see the list of items you need to locate from a local repository and for participation details. Archives, museums, historical societies, libraries and other groups are invited to participate in Illinois Archives Month by hosting local events, exhibits and activities that highlight the management and preservation of our documentary heritage. For information on ways you can showcase your agency’s collections and activities, please visit http://www.cyberdriveillinois.com (click Departments, Illinois State Archives, Illinois State Historical Records Advisory Board). View the Illinois Archives Month Poster here. Mississippi's theme, “Reflecting Mississippi,” allows archives to showcase their multifaceted collections that represent an historical and ever evolving state. Organizations are participating in a variety of ways from hosting exhibits to conducting tours. Click here to see the list. Maine’s effort to show the importance of maintaining records this month is apparent. Secretary of State Matt Dunlap noted the October 3rd announcement that the last reparation payment required under the Treaty of Versailles had been made, officially concluding the First World War. “In the case of the German reparation payments, it’s really astonishing to reflect on the level of records management, accountability, and diligence that’s been required to make the issuance and disbursement of these payments over nine decades possible,” said Dunlap. Germany surrendered to the Allied forces in the armistice signed on November 11, 1918, ending hostilities in the field. The subsequent Treaty of Versailles demanded that Germany take responsibility for the war and pay the allied victors some $33 billion in reparations. The last payment of $95 million was transmitted on Sunday, October 3, 2010. The money has been earmarked for bonds held by individuals, corporations, and pension funds as directed under the auspices of the Treaty of Versailles. While an announcement about the official end of the First World War in 2010 seems laughably obvious, said Dunlap, the long-term costs and effects of the cataclysm of World War I are everywhere and ongoing, and in the case of the payments for reparations, wholly dependent on sound recordkeeping. The historic records collections housed at the Cape May County Clerk’s Archives were celebrated at the Sixth Annual Archives Day on October 13. County Clerk Rita Marie Fulginiti hosted the event which was highlighted by a lecture by local historian Michael Conley of Dennisville on the capture, trial, and execution of Richard Pearce, Jr. of Goshen who was found guilty in 1894 by a Cape May County Jury and hanged to his death by the Sheriff. County Clerk Archivist Diana Hevener presented an archival document exhibit pertaining to the 1894 case State vs. Richard Pearce, Jr., including court minutes and the judgment signed by New Jersey Governor George T. Wertz commanding the Sheriff to execute Pearce by hanging. In the historic 1850 Court House Fulginiti spoke about the history of Cape May County government and the administration of justice in the county courts in session since 1692. After the presentation the attendees took a walking tour to the site behind the court house where the hanging took place and on to the archives for a tour and discussion of the public records collections housed there. Visit here. 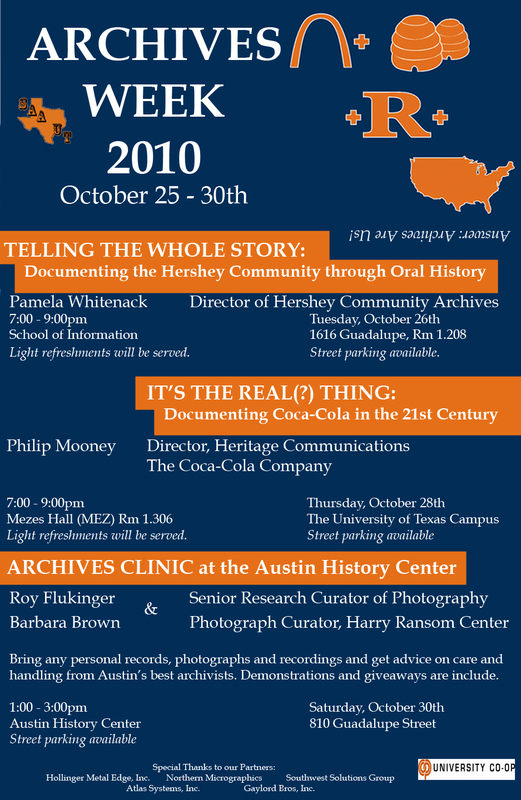 "Telling the Whole Story: Documenting the Hershey Community through Oral History"
"It's the Real(?) Thing: Documenting Coca-Cola in the 21st Century"
Bring any personal records, photographs and recordings and get advice on care and handling from Austin's best archivists. Demonstrations and giveaways are include. Take a look at an event flyer here.